Of course, no one ever called me "A brain in a vat," which is the label a scientist Helene Mialet placed on the famous Stephen Hawking in celebration of his birthday. You can read the complete news article in the Daily Mail here. Apparently the woman is no Star Trek fan or she would have labeled him a cyborg, since she intimates he is more machine than human. There's been no response from Hawking. On the surface, it seems to be denigrating. Activists have jumped in to call the label "dehumanising and disrespectful." On the other hand, it poses a philosophical question. Who are we? Are we the sum total of our physical being? Or are we a separate manifestation of what that physical being generates? Our physical self certainly informs our personality, not entirely because of its presence or interpretation in the mirror but rather because of the social and aesthetic norms of the societies in which we live. But Who are we? is also formed by what we do, and in that case, Hawking is more than the sum of his defective parts. But "A brain in a vat?" Obviously, the woman in a quest for publicity, has chosen to I label Hawking with a simplistic, head-seeking phrase, offering a glib bow to his intellect when it is evident that his intellect is not all that makes the man a genius. Hawking could be termed, were you seeking attention, "A brain in a vat," but to be Hawking requires an immeasurable, unidentifiable self-discipline, curiosity, courage, and other laudable human emotional and psychological factors. As could be expected the Mail gets it completely wrong-- she's arguing just the opposite--that Hawking is NOT a brain in a vat. Rather, she argues, "he is more “incorporated” than any other scientist, let alone human being. He is delegated across numerous other bodies: technicians, students, assistants, and of course, machines. Hawking’s “genius,” far from being the product of his mind alone, is in fact profoundly located, material, and collective in nature." She concludes "Hawking’s persona, his disability, and his embodied network thus becomes a window on our machines, the nature of work, and even our representation of scientific heroes. 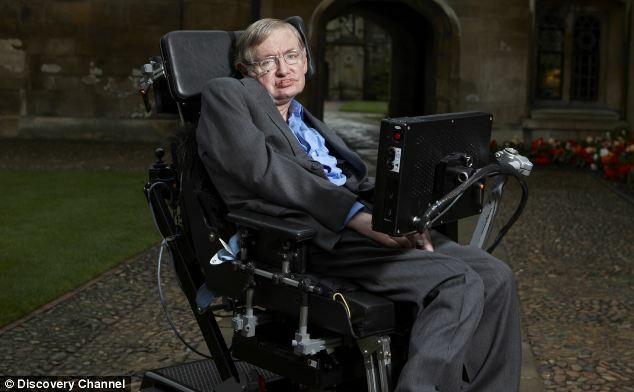 Popular media shows us that Hawking is a pure, isolated, once-in-a-lifetime genius; ethnographic analysis shows us that Hawking is not that different from other scientists even though he has a disability. In fact, it’s precisely because of his disability that we get to see how all scientists work … and how the entire world will work one day. Because, surrounded as we are by our world of technology and digital information, aren’t we all disabled? We, like Hawking, like Obama and his brain trust, are unable to think and complete the results of our thoughts without being attached to a network of people, instruments, machines – and the living laboratories through which it is all distributed." Stephen is one of my heroes and not only because he was worn on exactly the same day as me. I can picture myself next to him in heaven waiting to be born. He says, "What are you going to achieve?" I can't hear my reply--I'm too busy asking him about his plans. He replies, "I'd like to think about the universe." To be able to exist in a needy body, yet retain his enthusiasm for his subject defies understanding. I salute him.